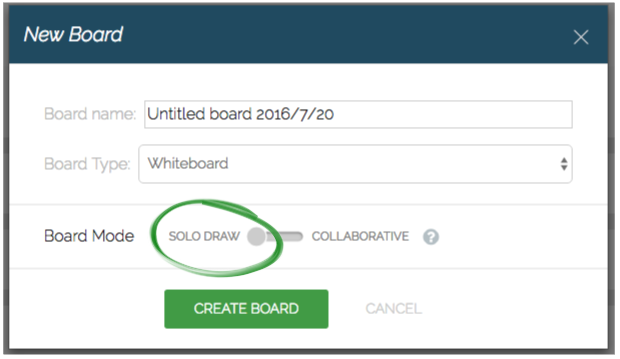 You can toggle any board you own (or admin) between Collaborative mode and Solo Draw mode. Collaborative is the default state of a board and means that anyone you invite to the board can draw on the board. If you put the board in Solo Draw mode, then only you can draw on the board until you put it back into Collaborative mode. In this new mode, people you’ve shared the board with can still use the text chat and video chat tools, and they can view and navigate the board, but they won’t be able to change anything on the board. Then when someone joins your board, as long as the board is in Solo Draw mode, instead of the regular color & drawing tools, they will see only pan & zoom tools in their toolbar. Their color & drawing tools will return as soon as you put the board into Collaborative mode. 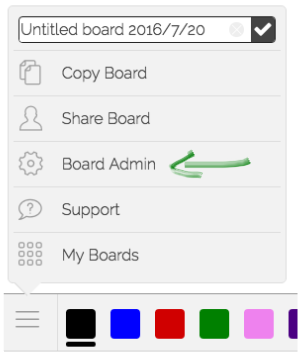 You can change the board mode using the Board Admin dialog, from the main menu. Here’s a direct link to your board list, if you want to try out Solo Draw mode right now.